Because I was working in the Bay Area on October 13, I was unable to take Lisa out to dinner on our actual 19th wedding anniversary, so we went out on Thursday night. We went to the Sparks Nugget's Steakhouse, making our reservation based on when our favorite waiter, William, would be working. We've known William since he was a bread server at the Oyster Bar. Nowadays we don't see him as often because we can't afford to go to the Steakhouse as often, but it is of course a step up in the world for him, and he told us how happy he has been to be working there. To start off with, William brought us (with the house's compliments), an appetizer of sliced elk with mashed potatoes and sliced melon. We both like elk very much, although we don't get to have it as often as when we were in Oregon, where the butcher across the highway often had it available. After a steak-and-potato soup course, we had our main orders. 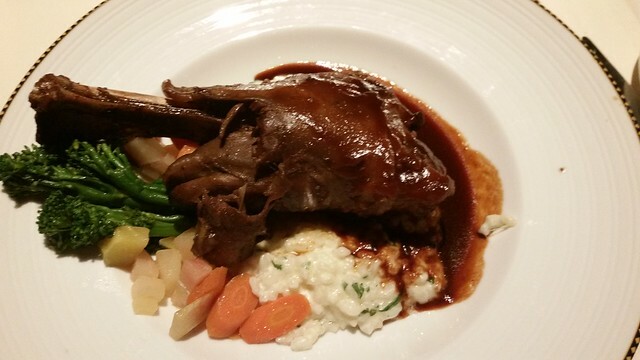 At William's suggestion, I had the lamb shank over Parmesan risotto. The lamb is sauteed in a wine sauce, and it was possibly some of the best lamb I've ever had. 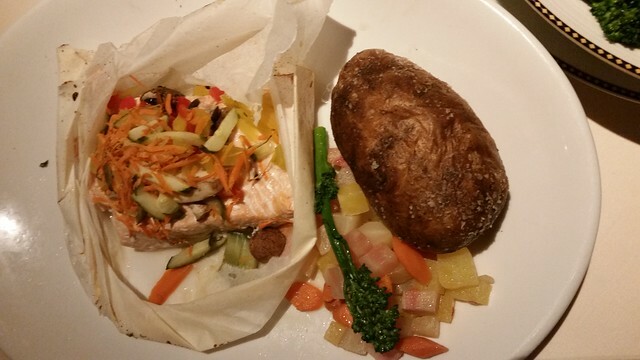 Lisa had salmon steamed in parchment with herbs. It was good, but after she tried my lamb, she said she wished she'd ordered it instead. In fact, she says the salmon she had at Hill's Restaurant in Spokane was better; mind you, it had just been flown in from Alaska that day, and was wild caught rather than the farmed salmon the Nugget uses. The timing of our dinner was such that William had some time to stay and chat with us over dessert. (He'd been serving a big party earlier, but their big arranged dinner ended well before we were finished.) We've been following his progress through school. A medical scare led him to take a semester off to recover while still working, but he's recovering and returning to school, where he expects to complete his double B.Sc. in Computer Science and Business/Finance next year. We probably will lose him soon after that as he's looking to move to Seattle, where he hopes eventually to start his own company. For all of the great food we had in this meal, it was really quite reasonable priced, even after I tipped generously. I've certainly paid far more for far less elsewhere. Lisa and I are not thrilled with most of the changes the new owners of the Sparks Nugget have made to the casino; however, the Steakhouse and the Oyster Bar remain great restaurants, and we're enjoying them while we can.